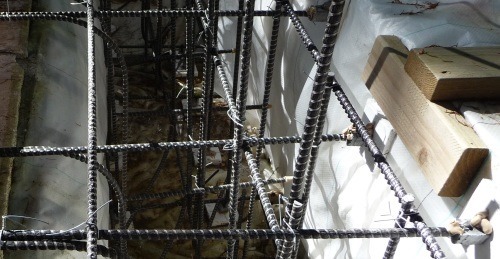 It is common practice to cut or bend main reinforcement in beams and slabs where it is no longer required. But tensile steel should never be discontinued exactly at the theoretical cutoff or bend points. It is necessary to resist tensile forces in the reinforcement through embedment beyond those points. All reinforcement should extend beyond the point at which it is no longer needed to resist flexure for a distance equal to the effective depth of the member or 12 bar diameters, whichever is greater except at supports of simple spans and at free end of a cantilever. Lesser extensions may be used at supports of a simple span and at the free end of a cantilever. Continuing reinforcement should have an embedment length beyond the point where bent or terminated reinforcement is no longer required to resist flexure. The embedment should be at least as long as the development length ld. 1. Shear is less than two-thirds that normally permitted, including allowance for shear reinforcement, if any. 2. Continuing bars provide double the area required for flexure at the cutoff, and the shear does not exceed three-quarters of that permitted (No. 11 bar or smaller). is the ratio of the area of bars cut off to the total area of tension bars at the section and d is the effective depth of the member. The location of theoretical cutoffs or bend points may usually be determined from bending moments since the steel stresses are approximately proportional to them. The bars generally are discontinued in groups or pairs. So, for example, if one-third the bars are to be bent up, the theoretical bend-up point lies at the section where the bending moment is two-thirds the maximum moment. The point may be found analytically or graphically.